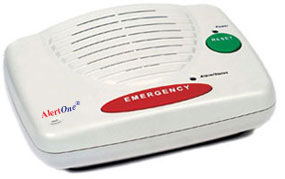 We purchase our equipment from AlertOne®, which is the largest supplier of medical alarm products in the nation. Our medical alarms are Underwriters Laboratories tested and listed to UL65 and UL67, the standards for Home Health Care Signaling Equipment. What does this mean? It means that an independent non-profit organization, with no allegiance to Blue Alert has certified that these alarms meet their high standards for public safety. Not all medical alarms have this listing because it is not required by law, it is voluntary. It costs more to build a higher quality alarm, but we feel that the safety and well-being of our loved ones is reason enough for these higher standards. Also available is a Blue Alert Fall Detection Sensor with activity monitoring. This unit is worn on the body of the protected person and will automatically call for help when either a fall or an abnormal period of no motion/activity suggests that an emergency condition exists. Like the medical alarm, the device also has a button for summoning help. 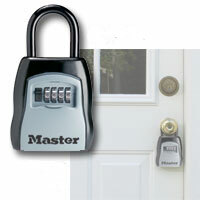 The Blue Alert key lockbox provides you with the security of knowing that you control who has access to your home. It allows you to keep your door locked , while still allowing your family, friends, and emergency personnel access to your home. Simply hang the lockbox, with your door key inside, on your outside doorknob and give the combination to trusted family, friends, and neighbors who you want to enter your home when needed. If an emergency arises, the Blue Alert monitoring center will notify emergency personnel of the combination so they can quickly and safely enter your home. All of our Blue Alert products are warranted 100%. If at any time something is not working properly, we will replace it free of charge to you.